Think about values and messages you want to pass along. Having your own answers to questions about dating will help you talk with your teen about healthy relationships and dating violence. Tell your teen that you want to talk. Let them know what you want to talk about. Find a time and a place that will allow you to be comfortable and relaxed. Make sure there are no distractions. It is best to talk when there is no competition for attention. So avoid having the conversation while doing something else like cooking or watching TV. Be open and honest with your teen, but decide what information you want to share. This may mean you don’t discuss items you consider to be very private or that might set a bad example. It is sometimes difficult for parents to talk to their teens about dating violence, but what you do feel comfortable discussing will help your teen know you understand. It will help him or her remember you were once the same age. Listen to what your teen is saying. Let him or her finish speaking, even if you do not agree with what is being said. Stay on topic. Your teen may want to avoid or change the subject, so keep the conversation on track by repeating your thoughts or asking questions. Stay levelheaded. If the conversation gets heated and your teen reacts in a way that you do not like (e.g., rolls his or her eyes or looks away), do not get upset or yell. Instead, take a deep breath, try to relax, and start talking again when you feel calm. Continue the conversation. This conversation will continue to evolve over time, with you providing information that’s appropriate for your teen. If you keep the lines of communication open, your teen will be more likely to come to you if/when a problem actually occurs. Set a good example. Your teen may be observing you even when you do not know it, so make sure your actions match your words. Think through things before you speak, listen patiently, provide encouragement, and treat everyone with respect. Never interrupt, call people names, or lash out at others. What if My Teen Is Being Violent? Create a safe environment for discussion. Encourage your teen to talk, but do not force him or her to open up. Thank your teen for sharing. 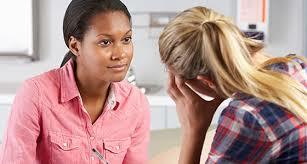 Seek expert help for your teen, such as a hotline, counselor or youth group. Tell your teen it is your job as a parent to keep him or her safe. Check in regularly with your teen. Praise your teen when he or she is kind and respectful to others. Show your teen how he or she can maintain his or her desires and needs without using violent behaviors.